Right. This was going to be just a one word review (that word is "don't") but in the spirit of Spinal Tap, I think a two word review is in order. You're better off with a dog's breakfast. Really. The limp offerings include some kind of deep fried black pudding purported to contain pig's feet, but there was no evidence to back this, at least in my friend's entree. His wife's rice/veg/fish dish was student food. And the cassoulet was a tragedy. It was dry. Contemplate what you have to do in the kitchen to end up with a dry cassoulet. At any rate, don't go to Tony's Table. I've been baking bread. A lot of bread. Well, a lot for a household of two, not a lot for an industrial factory like Wonder. I've been making a medieval loaf modeled after the Pain Poilane, named for the baker who revived and commercialized it, Lionel Poilane. His brother, Max Poilane and his daughter, Apollonia Poilane, still bake the bread in Paris; Max has a small, boutique practice manufacturing hand turned loaves. Anna has a substantial factory using kneading machines, but with wood fired ovens and controlling for quality rather than minimising cost. 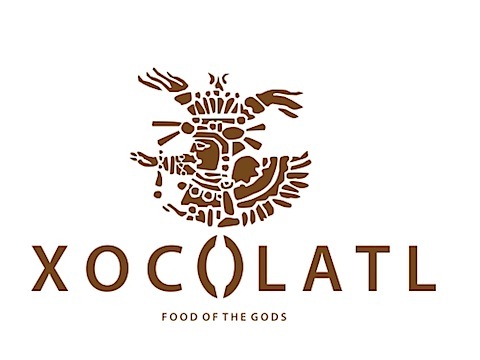 Pain Poilane was introduced to me by my friend Ghabida, who designed the logo for Xocolatl (click on the image for a larger picture) We had lunch after I got back from the family Ayyam'i'Ha celebrations and in the course of the conversation it came out that my bread baking skills had, in my estimation, greatly increased. She told me that the best bread in the world is Pain Poilane and nothing can beat it. Naturally, I took this as a challenge and set about researching the stuff. At any rate, I eventually found a series of bakers (the Bread Baking Babes) who, in 2008, under the leadership of the now sadly deceased Sher, attempted to replicate the Poilane loaf. They all tried it and blogged about it. The result was that I thought I'd try and make a sourdough Scottish Hearth Bread, the same way the Scots must have made bread when they would have cooked with wood burning ovens. I left a paste of rye and water out until yeast took hold. After four days it was a sour smelling frothy mixture and very sticky. If you try this at home, wait until it smells like vinegar; there's a sharp point that started around day two and went into day three where it was seriously pungent, not at all in a good way, and we just needed to wait it out. Then you make a "firm starter," which is basically fresh yeast that you make at home. Work a cup of flour into a cup of sourdough starter and let it sit out for 24 hours. Then you make bread. There are many different instruction sets on the web, but I used a three stage process with a proving oven set to 40 degrees. I use my combination microwave/convection oven as a proving oven, since it has settings that go all the way down to 40 centigrade (104 Fahrenheit). The three stage process is to add the firm starter to two cups of water, two tablespoons of salt - I feed mine a teaspoon of barley malt extract and a single egg yolk, too - and three cups of flour. You're going to need to work this dough until it is clear (I'm not sure if anyone else uses this term; its one that my friend Keith and I may have made up, but basically, it means that the dough will stick to itself but not much else and has a smooth appearance; you'll know it when it happens). In order to work a dough ball this size until it is clear, you can either knead it on a surface for about two hours or you can stick it in a kneading machine for forty minutes. Add flour in tablespoons and let the machine work it into the dough. At some point, the dough will no longer leave bits of itself on the side of your mixer bowl and will instead pull away, slowly. When you touch it, it will feel like a non-Newtonian dilatant fluid. Warning! If you have a Kitchen Aid or an Oster or a Kenwood or basically anything other than a Bosch or an Electrolux, you'll need to take extreme care. Sure, the Kitchen Aid is nice, but mine got hot and started to smell like it was burning; I had to turn it off and let the dough rest for half an hour while I cooled my mixer then start again. I'm experienced - this wasn't some newbie mistake - it's just that this is more dough than the Kitchen Aid can really handle. At any rate, let this rest a while, then turn it out onto a floured surface, knead it until your comfortable with the spring then drop it into a heavily floured linen and pop it into a dry, clean bowl in your proving oven. Leave it there for ninety minutes. Your mileage may vary; my first loaf had to be proved for three hours. My last loaf (number 6) was ready after twenty minutes. The starter gets stronger the longer you care for it, so the proving time will shorten. Then turn your now proved dough out onto a baking surface - I use a metal sheet dusted with corn meal - pre-heat your convection oven to 240. As soon as you put the loaf in, turn it down to 220 and bake for 25 minutes at 220, with two cups of boiling water poured into a pan on the bottom of your oven. Then turn the loaf 180 degrees and bake for 35 minutes at 200. 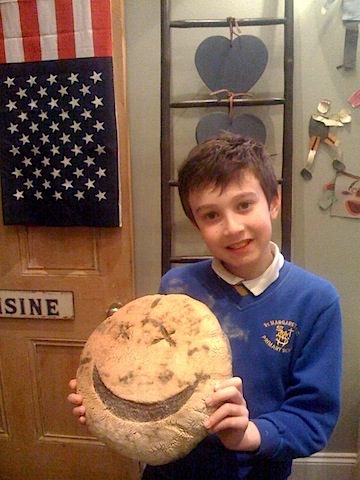 The Scottish Hearth Bread #5; click on the above link to see a larger picture of Theo, son of my friend Ghabida, holding the 5th loaf of Scottish Hearth Bread. He asked if I had a moustache, like other chefs! And I do, as you can see in the picture bar above my blog (that's me in the brown baker's apron). I wish my mother was still alive; she taught me how to bake and this is the first time I've felt like I've made bread good enough to let her judge it.